Mmm. 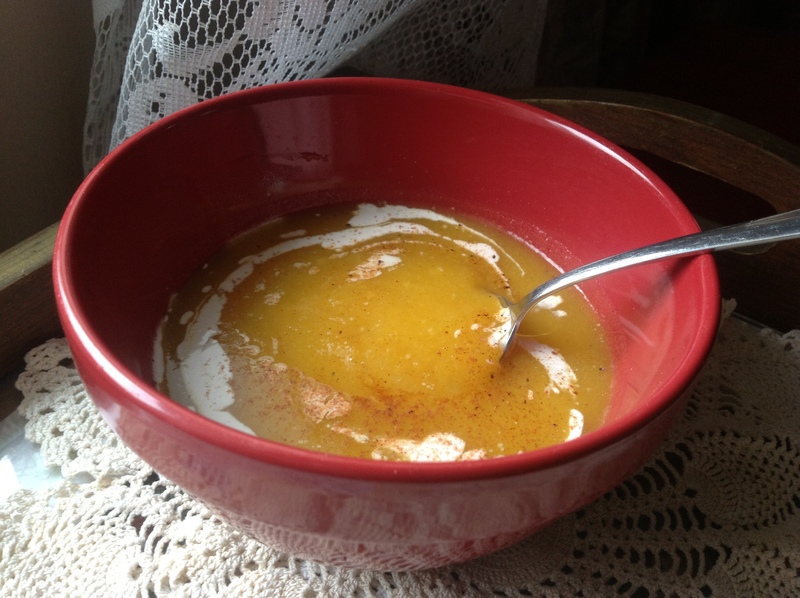 I cooked, served myself up a bowl, took a picture, and am now sitting down on this icy winter day to blog the process while slurping my soup. I feel like my old self again. Having said that, I’ve realized over the past few months that food blogging, or any other type, is just like Show and Tell Fridays in grade school. It’s actually pretty arrogant to type away saying, “Look at me! Look what I made!” Hm. Something to contemplate in the wee hours of the night when insomnia strikes. What is that all about? It’s an especially strange practice for a shy introvert like myself. Oh well. This is me and I don’t really care why, but I love blogging. I almost like it as much as I like cooking. 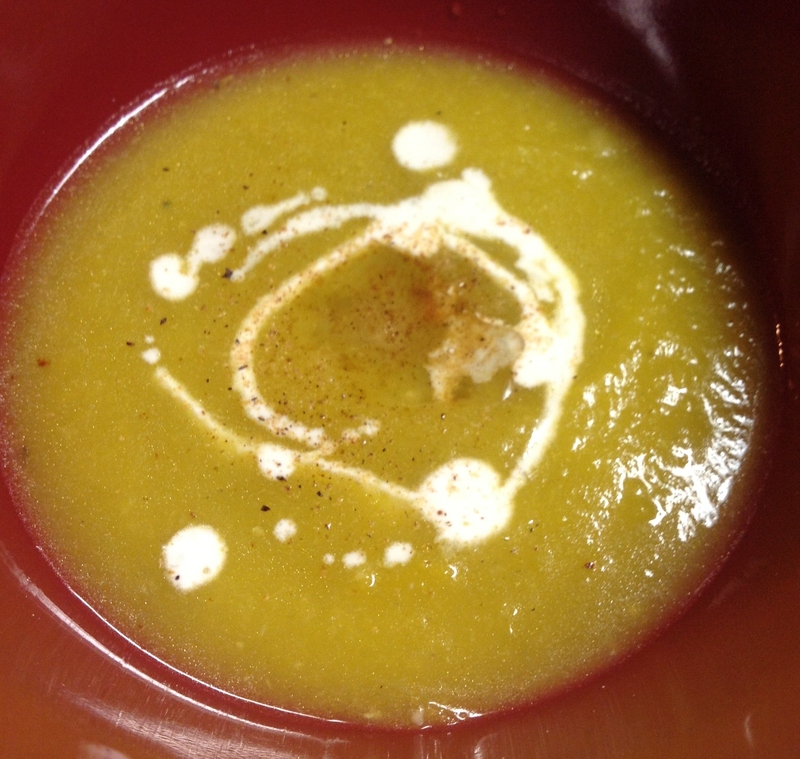 I’ve had bowls and bowls of this soup in the last week and it I’m still not burned out on it. Seriously, it’s the coconut oil, nutmeg, and almond “cream” that I garnish it with that I’m addicted to. The almond cream is just the thick layer that separates and rises to the top of my mason jar of homemade almond milk. It’s every bit as delicious as cow’s milk cream. And the coconut oil? Wow. 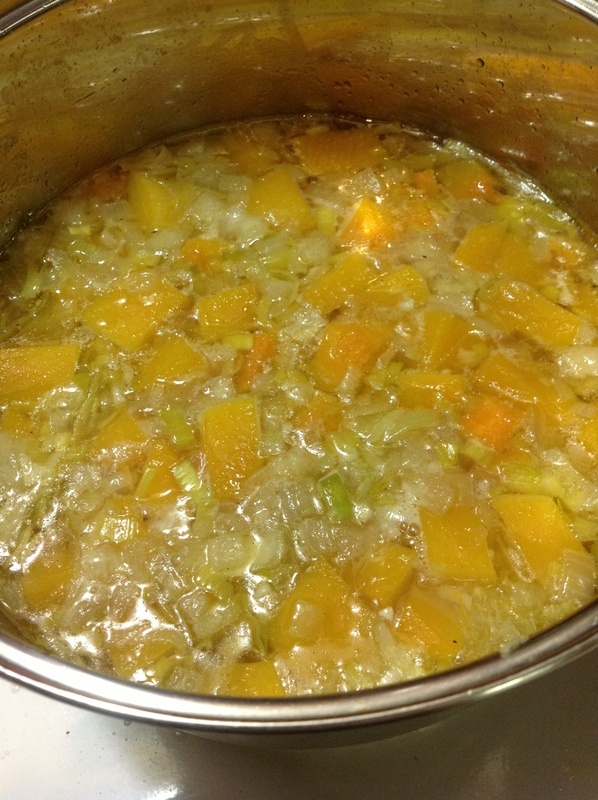 I’m so in love with this recipe that I have cooked a total of 14 cups of butternut squash in one week and a day so that I can eat it as often as I like. That’s a lot of squash! 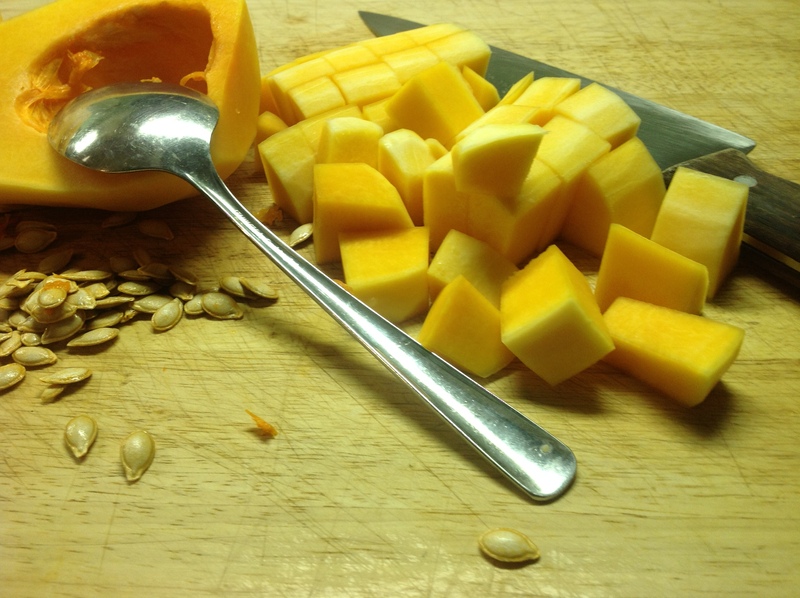 But butternut squash is loaded with beta carotene, and other antioxidants, provides fiber and essential B vitamins, so I’m really doing my heart and immune system a favor with every sip. The first time I made it I was all out of fresh ginger. So when I was standing in my kitchen trying to decide what I was going to do with the enormous butternut squash sitting on the counter, I thought of pumpkin pie, which reminded me of ginger and nutmeg. I started creating my soup and went ahead and used the dried ground ginger that lives on my spice carousel. The finished product was delicious, but on my last shopping trip I tossed some fresh ginger in my basket so I could remake my soup the way I would have like to the first time. Whoa. It’s just what I was looking for. The last thing I wanted was for it to actually remind me of Thanksgiving dinner. Not even close. But my bowl is now empty. Good thing there’s a whole pot staying warm on the stove. 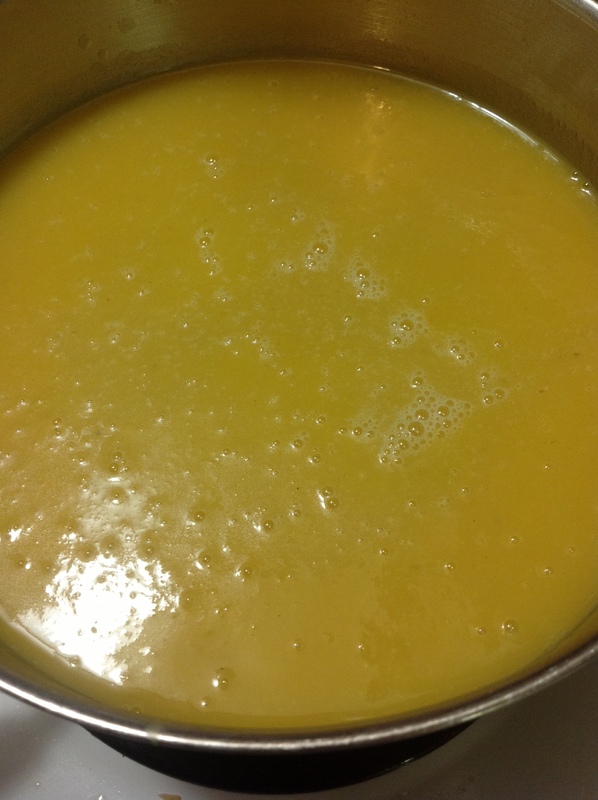 Heat the ghee in a medium stock pot. Saute the garlic until translucent. 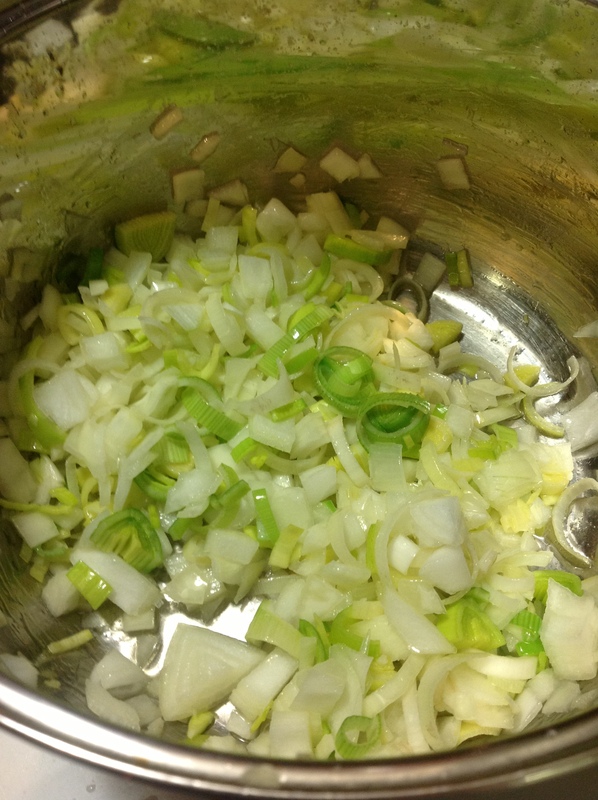 Add the ginger, leeks, and onions and continue cooking until tender. Add in the water and broth. Bring to a boil. Add the butternut. Return to a boil. 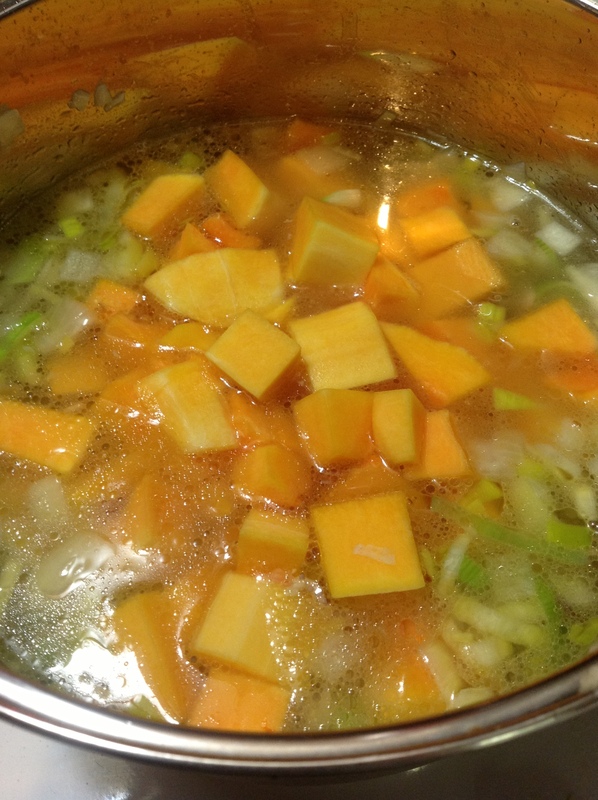 Reduce heat to a simmer and cook until squash is tender, app. 20 min. 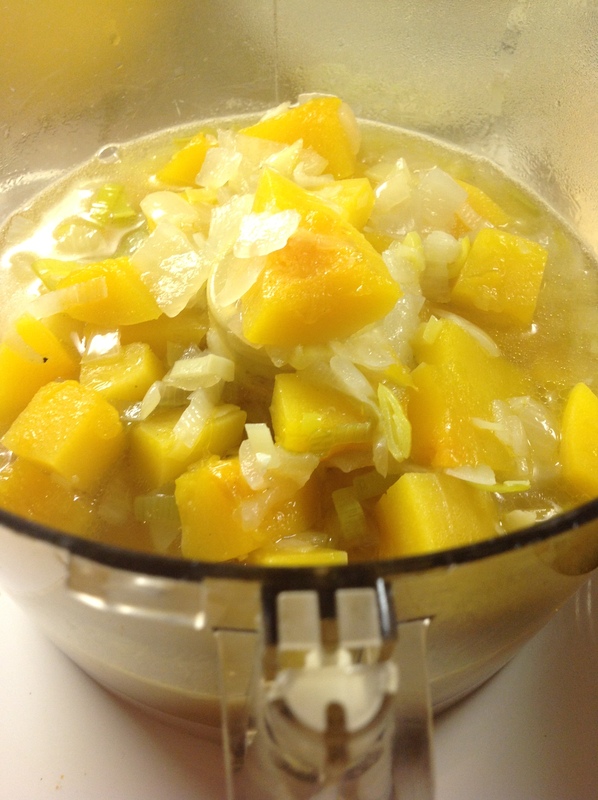 Puree in batches and serve or put back on the stove to reduce. I like mine very thick so actually put it back on the stove and let it simmer away while I work on other projects in the kitchen, stirring often. Spoon in to serving bowls. I top it with a dollop of coconut oil, maybe 1/2 to 1 tsp., then drizzle it with almond cream before sprinkling with freshly grated nutmeg. « Grr…Yes, I’m growling a bit, but I’m also smiling.